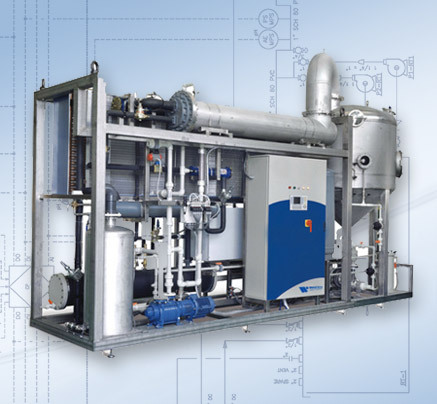 Heat Pump, Mechanical Vapor Recompression & Hot/Cold Water Cogeneration options treat industrial wastewater efficiently and cost-effecitively, providing a Zero Liquid Discharge solution. A Wastech Vacuum Distillation Evaporator (VDE) system is the equipment of choice for any plant that desires a Zero Liquid Discharge (ZLD) process solution, or simply wants to minimize waste and reduce operating cost. Wastech will provide you with a fully automated, PLC-controlled Wastewater Evaporator system that will greatly reduce or eliminate waste discharge at a fraction of the cost of traditional atmospheric evaporators. As water costs continue to rise and penalties for "heavy users" are being enforced at an increasing rate, many industries such as pharmaceutical/cosmetics, semiconductor, national & university laboratories, solar, biotech, medical devices, food & beverage, aerospace, power generation & energy, and oil & chemical manufacturing are seeking economical solutions to lower their water usage. Depending on flowrate and wastewater composition, a heat pump (low capacity), mechanical vapor recompression (high-capacity), or hot/cold water cogeneration (cogen applications) evaporator becomes an efficient water recycling option with a surprisingly short ROI - many customers enjoy complete payback in under 12 months. Evaporation is a natural phenomenon whereby a liquid is transformed into its gaseous state. To achieve this change of state, heat must be provided. Vacuum distillation evaporators accelerate this process and separate water from salts and liquids at lower boiling points without any filtration media or membranes. The result is a low conductivity, DI-quality distillate that can be recirculated back through your process and a concentrate with a water content potentially lower than 10%. Combined with extremely low rates of energy consumption, vacuum distillation evaporators provide simple and cost effective means for facilities to recycle their process water, lower operating costs and energy consumption, or move to a complete ZLD solution.